1. Combine all the stuffing ingredients and mix well. 3. Rub salt on the chicken skin. 4. Fill the cavity with the stuffing and sew the opening. 5. Steam cook the chicken, vegetables, coriander leaves and parsley for an hour. Place the bay leaves in the water. 6. Discard the parsley and coriander leaves. 7. Halve the carrots and cut the onions and potatoes into small pieces. 8. Place the chicken in a large serving dish. 9. Arrange the vegetables around the chicken. 10. Sprinkle some cumin powder and salt over the chicken or serve them separately. 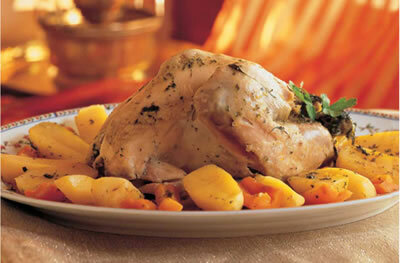 Feel free to comment or share your thoughts on this Herb Stuffed Chicken Recipe from Awesome Cuisine.